Looking for love within Canada? Wherever you are in Canada, as long as you are seeking love and companionship then EliteSingles,ca is the place to be. With over 90% of members holding either a Bachelor’s, Masters or Doctorate degrees, EliteSingles.ca is the home of educated singles across Canada. To get started with EliteSingles, you’ll have to provide your gender and the gender of the person you are looking for. Then, you’ll be required to provide an email address and a password for future log in purposes. The next steps will require you to provide general personal information such as your education level, employment status, marital status etc., your potential match such as height, weight, education level, social habits etc. After successfully completing the signing up process, your profile will be ready and you can immediately start seeking a potential match. 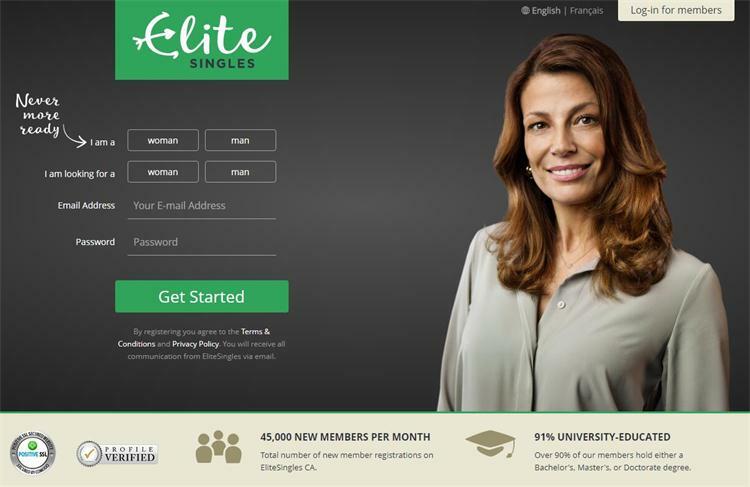 EliteSingles constantly fine-tunes their matchmaking algorithm so that they can only deliver the most relevant singles in line with their members’ online behavior and search criteria. With the hassle and demands of city life, it is only prudent that your dating platform of choice provides you with suitable profiles of 3-7 members who meet some certain compatibility attributes determined by your personality test and overall search criteria. EliteSingles is one of the few websites that demands that members take a FREE personality test that looks into an individual’s personal qualities and facilitates introduction and matching up of members to similar minded singles. The test is divided into 10 sections that comprehensively evaluate different attributes of members’ personality. Having a fully completed member profile is the first step to finding a suitable match in any dating platform. However, for educated singles, finding the time and the words to best describe themselves without appearing to be bragging might be a challenge and that is precisely where EliteSingles Expert Profile Advisors come in. With the help of the experts, you can learn how to create an engaging profile that is interesting to read. This is an online magazine published and updated regularly with relevant online dating tips and advice. Whether you are based in Toronto, Vancouver, Ottawa, Montreal or Calgary you can be sure that there is a fellow educated single out there. To help you get the best out of this feature, you’ll have to access that cities specific portal. Personally, I have never experienced such a delightful online dating website. EliteSingles has a very attractive, user-friendly and navigable website that makes using it a pure delight. With the aid of newly introduced Smartphone and Tablet iOS and Android apps, members can easily access the platform on the go from wherever they are within Canada and beyond. Additionally, whenever you experience a challenge that you cannot resolve through the FAQ section, you can swiftly contact the Customer Care support and they will resolve your issue speedily. When it comes to online dating platforms committed to linking up educated singles and professionals across Canada then EliteSingles come top of mind due to their unrivaled customer service experience and social proof such as success stories/testimonials. Social proof is of utmost importance when it comes to online dating industry; because it provides prospective members with an inside look on how the platform has been successful in linking up members in the past. Hi ! I’m new this group i’m wedow i’m searching man under standing and honest .God bless. Hi my name is Habtamu Mezgebu from Ethiopia and 29 years old please contact me on whatAapp + 251910271208 I need to live and love you upto my end of life okay.